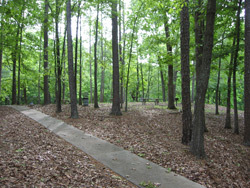 This park is located off of a Route 20 spur road, a short distance north of Cooper Branch # 1 and Allatoona Lake Visitors Center. 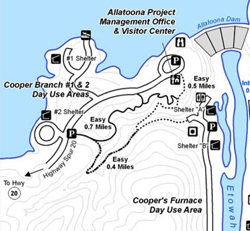 Signs for the visitors center are helpful in finding your way to Coopers Branch from I-75. Picnics - The park is relatively small relative to the other Corp of Engineer lake parks, at least in terms of the extent of the improved facilties. These mainly consist of individual picnic sites and a single group picnic pavilion. The group pavilion can be reserved for $50 and accommodates up to 75 people. 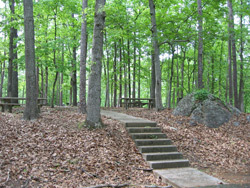 Trail Access - The other activity associated with this park is its access to some of Lake Allatoona's trails. The Laurel Ridge Trail can be accessed from the park. It connects with the Visitor Center trails that can be taken to Coopers furnace. 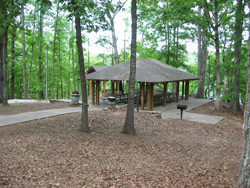 Some invidual picnic tables scattered underneath the pines (left) and a view of the group picnic facility pavilion (right). There are two covered pavilions, one covering picnic tables and the other built to protect the large barbeque grill. 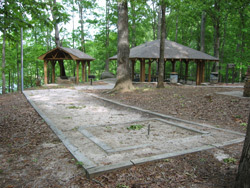 A horse shoe pit, with the group picnic pavilion in the background and a photo of some of the individual picnic tables in Cooper Branch #2.